TODAY IN RUSSIA: Putin visits Crimea to mark 5th anniversary of annexation, as costs continue to mount. Deripaska sues US Treasury over sanctions. Hundreds of anti-Kremlin protesters gather in Moscow. Council member investigated for reposting an MBK meme. “Russian troll” speaks to BBC. Russia to decide on furthering OPEC agreement in May. President Vladimir Putin arrives in Crimea today, where he will mark the fifth anniversary of the peninsula’s annexation by opening a power station in Simferopol. The State Duma’s International Affairs Committee is considering asking Kiev for compensation for economic damage inflicted on Crimea when it was part of Ukraine. Bloomberg charts the rising cost of the Crimea takeover, many of which stem from Western sanctions. The Moscow Times says sanctions have cost Russia 6% of its economy. Russia vowed to respond, in an as-yet undetermined way, to the newest sanctions from the European Union. Billionaire Oleg Deripaska is suing the US Treasury for the sanctions it imposed on him last year, claiming that the measures, which have caused an 81% decline in his net worth, were based on “false rumour and innuendo”. Deripaska denies any influence from the Kremlin in taking legal action, stating that he is suing in an effort to prevent his life’s work (“along with millions of jobs”) from being destroyed by an initiative that, he says, took him completely by surprise. 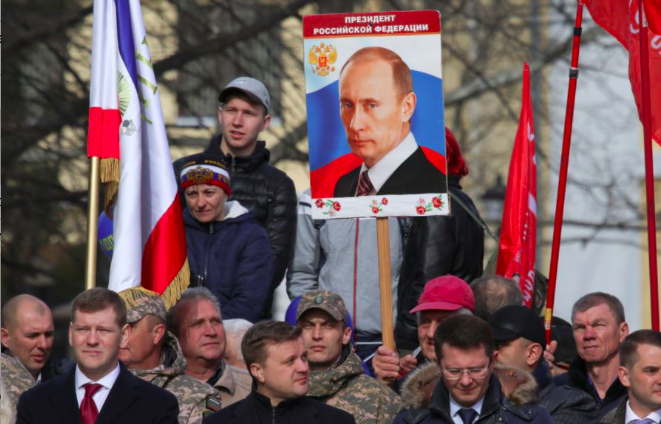 Several hundred opposition groups gathered in Moscow over the weekend calling for social and political change, citing recent pension reforms, tax increases, and the rising price of goods. A case has been opened against a district council member in Yeysk for reposting an image created by Mikhail Khodorkovsky’s MBK Media. The BBC’s Russian Service interviewed Sergey Polozov, one of the 13 “Russian trolls” employed by the Internet Research Agency allegedly to interfere in the 2016 US elections. Russia will decide in May or June whether or not to continue its pact with OPEC members. New evidence shows that former Putin adviser Mikhail Lesin had a complete neck fracture “at or near the time of his death”, which was ruled an accident.